Morphology. Are you looking for blood? The Bloods are a primarily, though not exclusively, African American street gang founded in Los Angeles, California. The gang is widely known for its rivalry with the Crips. They are identified by the red color worn by their members and by particular gang symbols, including distinctive hand signs. 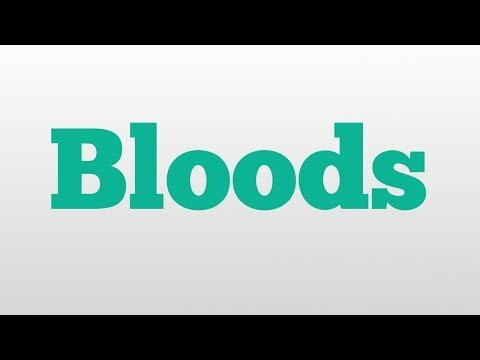 Bloods a.k.a. The Sydney Swans is an Australian rules football club which plays in the Australian Football League. The club has been based in Sydney, New South Wales since the South Melbourne Football Club was relocated to Sydney in 1982. Sydney was the first club in the competition to be based outside Victoria. The Swans play most home games at the Sydney Cricket Ground, while local derbies and larger games against teams such as Collingwood are played at ANZ Stadium. The Bloods were formed from the merger of various Los Angeles street gangs such as the L.A. Brims, Denver Lanes, the Inglewood Family, the Swans, and the Pueblo Bishops, who opposed the rise of the Crips megagang in the 1970s. Don&apos;t miss Saturday&apos;s broadcast of EFL Gameday on 98.1FM! See also the pronunciation examples of Bloods! See also the blanagrams of Bloods! Go to the usage examples of Bloods to see it in context!